“What’ll you have?” asked the server who stood beside me. I looked at the lunch menu that was hand written on a large dry erase board. “Maybe everything. It all sounds good,” I said. Everything on the menu was good country cooking. Chicken casserole. Meatloaf. Green beans. Pinto beans. Mac and cheese. Fried apples. Cooked cabbage. Stewed potatoes. Fried corn. Slaw. And cornbread baked in a black skillet. This was my second lunch outing to Cole’s County Store. I’d recommended Cole’s, located here in Putnam County, to my college roommate and her two Davidson County teacher friends because it’s like going home to mom’s and grandma’s kitchens. And that welcome is exactly what owner, Marcia Cole Huffman, intends. But why did she buy a rundown, century-old building that had been boarded and empty for years and is located on Highway 70 west of Baxter, miles from other retail businesses? And why open a meat-and-three restaurant? Marcia’s close friends and sisters discouraged her. 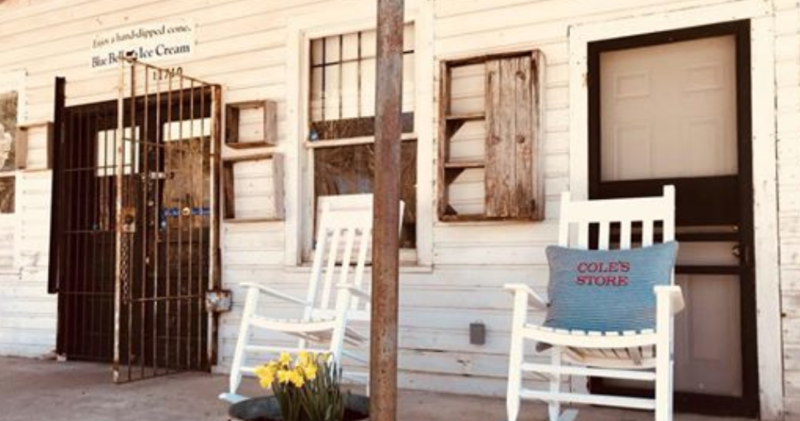 They advised her to not consider buying the store when it was advertised for auction, but Marcia could not let her great-grandfather’s store go to someone outside the family. “I was obsessed,” Marcia admitted. Marcia thought she’d update the building to be a country residence and a place for family gatherings, but when community members saw work being done on the abandoned store, they assumed it was going to reopen. Marcia said, “The whole thing spiraled!” Tish wanted to open a “meat-and-3” and she talked with Marcia. Neighbors, family, and friends helped Marcia and Tish equip the kitchen and provided store furnishings from the mid-1900s when the store was in its heyday. Heart and opportunity. That’s why Marcia bought the old Cole’s Store and opened a restaurant. It’s worth a drive down highway 70; just don’t be in a hurry. You’ll want to sit and talk a spell, like I did. The meatloaf, mac and cheese, green beans, and coleslaw tasted like home. Who cooks supper meals? Remember meat-and-three-meals? Pork chops, fried chicken, beef roast, or meatloaf and three sides. Vegetables such as potatoes, green beans, corn, peas, cole slaw, and carrots. Mom cooked like that. And sometimes she served homemade soup with hot cornbread or spaghetti topped with her special tomato sauce and meatballs. That’s the suppers I ate as a child and I learned to cook at Mom’s elbow. When friends reminisce about the first meals they ate as newlyweds, they tell funny stories because the wives didn’t know how to cook. My newlywed story is different. A few months after Husband and I married, I remember him telling me, “We really don’t have to have a big supper with meat and vegetables every night.” I took him at his word. I’ve always like cooking – like to chop, dice, bread, measure, mix, knead, sauté, brown and bake. But planning and shopping are chores. If someone would just tell me what to cook and buy the groceries, I’ll cook. I’ve been in a slump and I looked for other meal options. Anyone else tried mail order meals? I ordered by email and UPS delivered a box of food packed on ice on my doorstep. Inside was everything needed, with directions, for two meals for Husband and me. Everything for Crispy Rice Chicken Katsu with roasted Chinese broccoli. Everything. Including a liquid egg, ¼ teaspoon red pepper flakes, and 2 fluid ounces Tonkastu Sauce. The meal was delicious, easy to prepare, and I loved that I didn’t have to buy a large amount of an ingredient that I rarely use. One box included 2 teaspoons of Chicken Demi-Glace and 3 thyme springs and 1 red fresno chili. To avoid planning and for easy shopping, there are fresh ready-to-cook meals available in the grocery stores. Sweet chili chicken, mild Italian sausage with sweet peppers and onions, flank steak stuffed with spinach and provolone. All ready for the oven or microwave. Even taco soup for my crockpot. And salads are bagged with cut lettuce and carrots, dressing, and croutons. All I have to do is open the plastic bags and dinner is ready. Frozen meals have come a long way. Remember TV dinners in the 1950s? Meat drowned in bland brown gravy and tasteless mashed potatoes and diced soggy carrots weren’t acceptable on Mom’s table. But oh, the frozen meals choices today. Beef Lo Mein, Alfredo Chicken, Three Cheese Lasagna, Chicken Pai Thai, Chicken Pot Pie. And there are kids’ meals with chicken nuggets, mac and cheese, and broccoli. And delicious prepared meals are available from local caterers. Take the food home, heat it, and serve. Nothing could be easier. Voila! Dinner is served! I’ve tried mail order meals, meals in a box, meals in plastic bags, catered meals. Some passed the test – as good as Mom’s. Most didn’t. Time to make this week’s menu and shopping list, including what I call ‘find-it, eat-it’ meals. Husband is good with that. Last week I wrote about Mom’s recipe for pie filling and later as I layered slices of bananas, vanilla wafers, and pie filling to make the best banana pudding ever, I decided it was time to overcome my aversion to eating a plain banana. I like everything about bananas, except their slimy texture. The ripeness doesn’t matter. 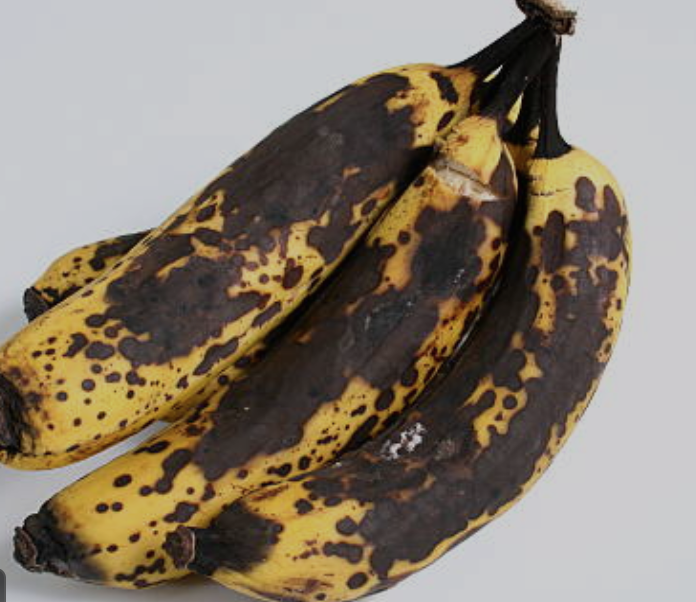 Green or black-speckled, all bananas feel slimy. Bananas are perfect snacks to eat quickly and easily and they’re healthy. They provide fiber, potassium, vitamin B6, vitamin C, and various antioxidants. They may even help prevent asthma, cancer, high blood pressure, diabetes, cardiovascular disease, and digestive problems. I like a banana’s flavor, its convenience, and its health benefits. But every time I’ve tried to eat one, the slimy, mushy texture triggered my gag reflex. One bite, one chew, and I breathed deeply to avoid spitting it out. I told myself it’s a healthy fruit and its potassium might alleviate night leg cramps. The antioxidants are good for my heart and keep free radicals (whatever those are) from attacking my cells. And it’s cheap and I don’t need a plate or spoon. But in the past, mind over matter has never worked. That bite grows bigger and slimier the more I chew. Friends have told me I need to pair a banana with something else, and peanut butter and bananas are natural partners because the banana offers quick carbs and peanut butter offers protein. Since a spoonful of peanut butter is my favorite quick hunger solution, it was worth a try. I sliced circles of banana and topped them with peanut butter. The flavors definitely compliment each other, but after one bite, I couldn’t eat another. I smashed a spoonful of granola into the peanut butter. It was better, but I only managed two more bites. Sunflower seeds are crunchy so they would surely camouflage the banana. How can sliminess overpower crunchiness? Next, I made fruit salad with apples, peaches, grapes, and small chunks of banana. I won’t notice anything except crispness I told myself. But that was a lie. My tongue rolled over the slimy banana and I chewed quickly and swallowed. Sweetness could surely make a banana palatable. I cut three banana slices and dipped each into one of three sweeteners: chocolate syrup, honey, and brown sugar. All were delicious, but still slimy. Enough sweetness makes anything go down. I’d kid myself to think the nutritional benefits offset the harmful sugar effects. So now I’m back to accepting that I don’t eat bananas although I do love Mom’s Banana Pudding and banana splits and banana bread. What’s better that a sliced banana with three scoops of ice cream (one vanilla, two chocolate) topped with chocolate syrup, real whipped cream, and a cherry? And overripe smashed bananas baked in banana bread surely provides some antioxidants and potassium and all that other healthy stuff. But I still wish I could peel a banana, take a bite, and enjoy it. Suggestions, anyone? Husband calls it Real Banana Pudding. I call it Mom’s Banana Pudding, but we agree it’s delicious. 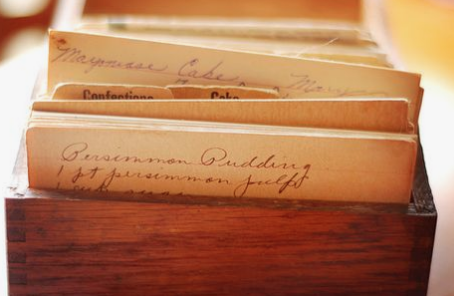 My stained and frayed 3 x 5 recipe card for the pudding is labeled “Pie Filling” and “from the kitchen of Mother.” The penciled writing is Mom’s and mine. Recently, I took banana pudding to Husband’s family gathering and the dish was practically licked clean. The best compliment possible. “I bet you cooked it in a double boiler. It’s a lot of trouble,” Husband’s cousin said. I said that Mom taught me how to make pie filling years ago and it’s not trouble, just takes a little time. Mom used the same basic recipe for all cream pies and banana pudding, and it’s the one I still use. About fifty years ago, Mom and I made a chocolate pie. She recited her recipe and we took turns measuring, stirring, and writing this recipe as we worked. Mix the cocoa, flour, and sugar. Add milk and cook ‘til the pudding is nearly thick. Add the beaten eggs yolks and cook ‘til thick. Add margarine and flavoring. Variations: Vanilla- leave out cocoa. Coconut – no cocoa, add ½ c coconut. Pineapple – drain juice from small can of crushed pineapple and use juice to substitute for some of the milk. For banana pudding, make vanilla pie filling. Mom and I didn’t write details. I’ve learned to use whole milk, like the milk Mom used from our cow Dad milked every day. Separate the eggs. 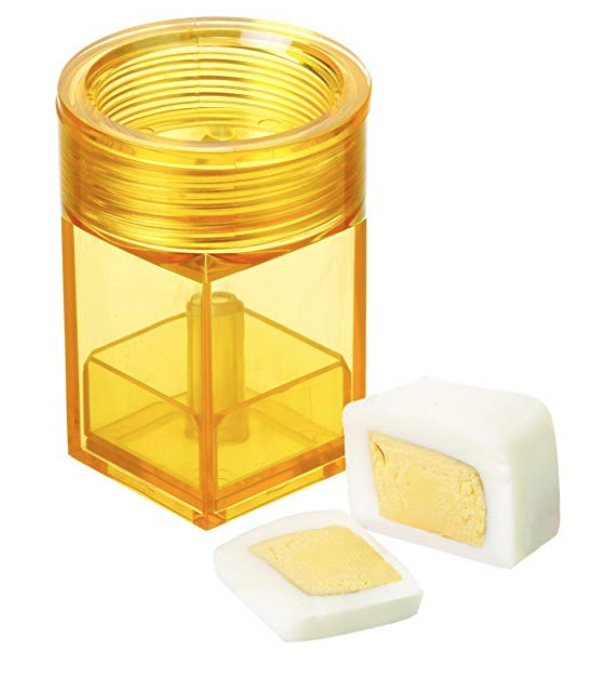 Beat the yolks in a small bowl; place the whites in a glass bowl to make meringue. Mix the flour or cornstarch (my choice) and sugar and milk in a heavy saucepan, cook over medium heat and stir often. When the mixture thickens, add a few spoonfuls to the beaten yolks and stir to warm the eggs before adding them to the hot pudding. Pour the egg mixture slowly into the pudding and stir continually. After the mixture thickens, remove from heat. Add margarine, (or butter) and vanilla and stir. Line the bottom of an 8” x 8” baking dish with vanilla wafers. Top with a layer of sliced bananas and then ½ of the pudding. Repeat the layers. Beat the egg whites, ¼ cup sugar, and a pinch of cream of tartar at medium speed until the whites are fluffy, and then spread them over the pudding. Brown in a 350 degree oven for 10 – 12 minutes. 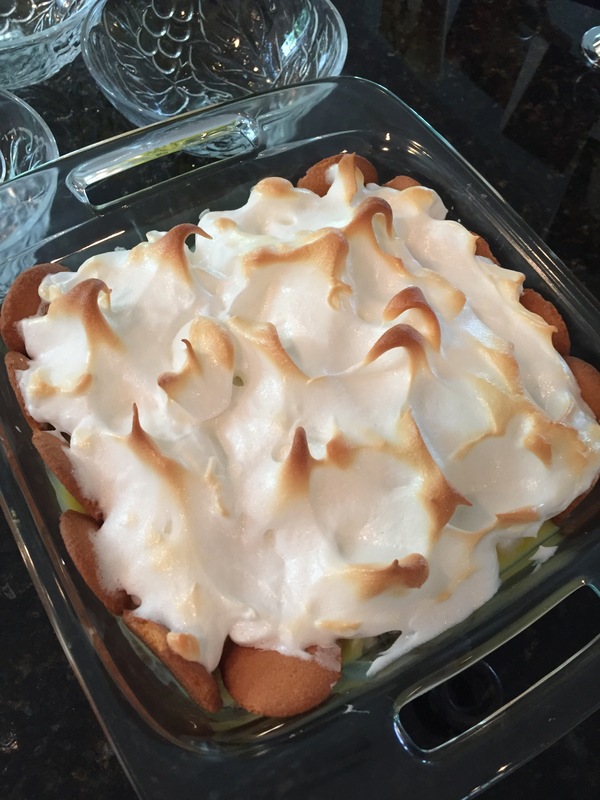 There are many recipes for banana pudding and all cooks have their favorites. This is mine. Not just because it’s real banana pudding and Husband’s favorite, but also because every time I pour warm beaten eggs into hot pudding, I see Mom wearing an apron tied around her waist, stirring with a wooden spoon, and standing beside her stove in an un-air-conditioned house. I treasure that memory.